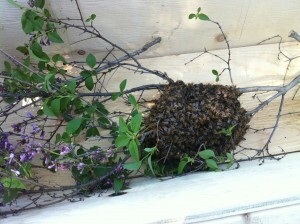 Home › What Do I Do If I Have A Honey Bee Swarm? 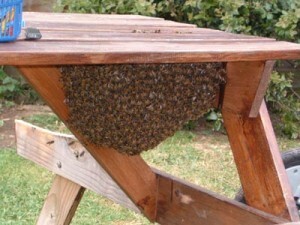 What Do I Do If I Have A Honey Bee Swarm? If you have a honey bees nest inside a structure (a wall, a shed, in a tree hollow, etc) this is NOT a swarm and the BBA will not attempt to remove them. You can go here to find bee rescue groups near the GTHA that deal with established nests. 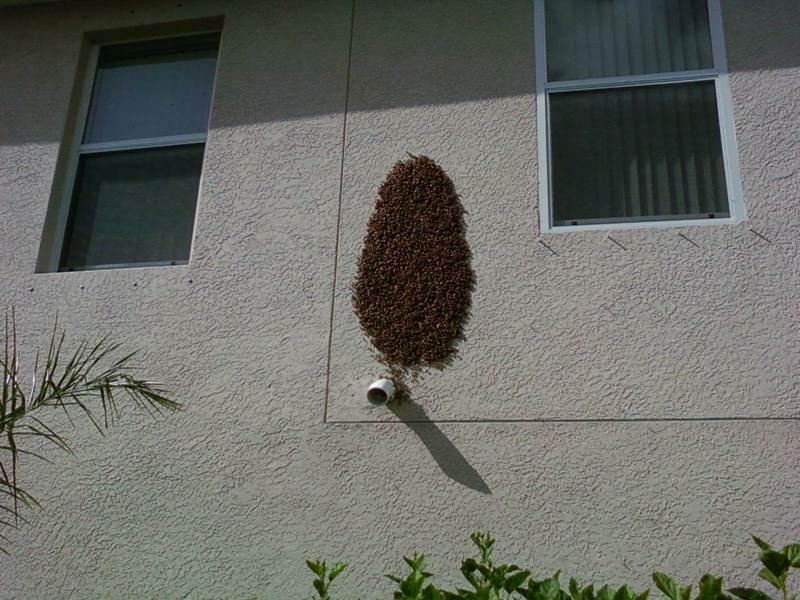 If you have a loose collection of bees hanging from an exterior structure, that is a swarm! When did they arrive/when did you notice them? Can you snap a picture from a safe location and email it to us for confirmation? 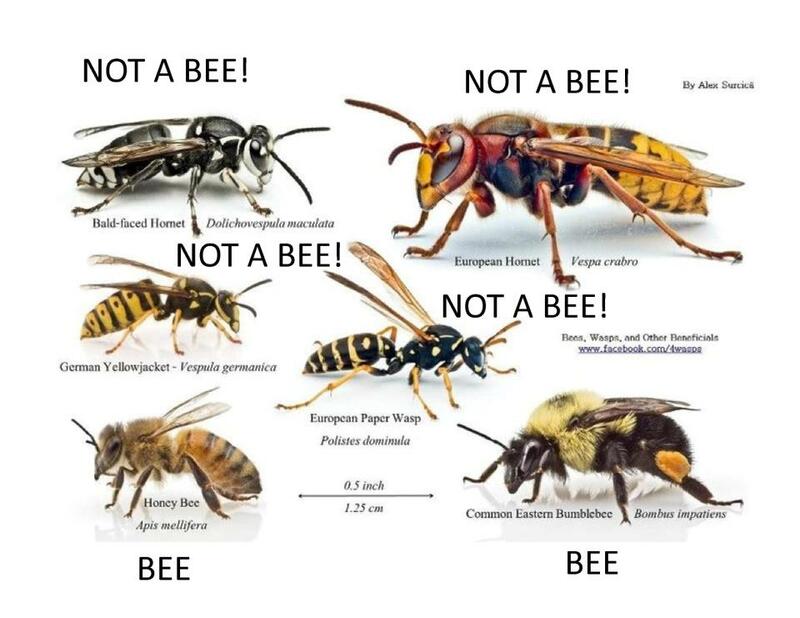 Please Remember… If you have already sprayed these bees with an insecticide, please do not call a beekeeper. It’s too late for them and us. We will get back to you within 2 days (excluding weekends and holidays). If they are honeybees and are swarming (not an established hive) and a beekeeper would like to collect, them they will contact you. If this is an emergency and you cannot wait please call the City of Brampton Animal Control at 905-458-5800. Their after hours emergency # is 311 (then follow the voice prompts). 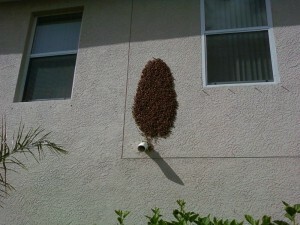 If you know they are wasps and want advice, it is best to call around and get a few quotes from exterminators. The BBA does not remove wasp or bumblebee nests (they are important pollinators, and on the decline). Bee swarms are part of the reproductive cycle of the honey bee colony: it is how they create more hives in the wild. Think of it like a hive giving birth to a new colony who then goes looking for a new home. Swarming behaviour is induced as bees increase their population size -the hive gets very crowded and they realize they require more space. Signals are sent. A queen egg is laid, and soon hatches. 40 – 60% of the worker bees form a swarm just outside the hive entrance after engorging themselves on honey (think of it like filling the car with gas and loading the trunk with food supplies!). They force the old queen out of the hive after slimming her down so she can fly and take off en masse. Fascinating. Why Are They On My Property? They are looking for a new home at least three miles from the old one. You are their stopover while the search is being conducted! They will hang in a cluster, usually on a tree branch(or walls, couches, fences, etc), whilst they send out scout bees to look for a new home. Once the home has been found they’ll be off again, this time to their permanent location. If no home can be found, they will move somewhere else and send out the scout bees again. Because the bees are so full of honey stored in their stomachs for this journey, they will be relatively passive and less likely to sting. If they have been searching for a home for several days, and if (due to weather) food stores are depleted, the bee swarm may lose some of its passivity -so always treat a honey bee swarm with respect. Please don’t reach for your can of Raid right away! In most situations you do not need to do anything. 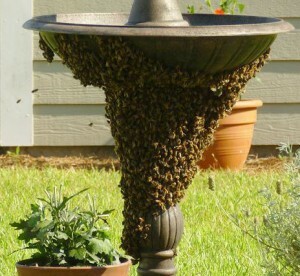 Swarms are temporary and the bees will move on if you patiently ignore them. 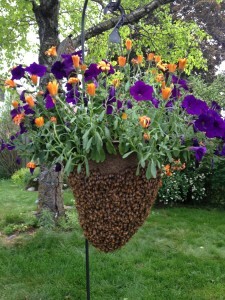 Stay back and keep others away from the swarm, but feel free to admire and appreciate the bees from a safe distance. Only if a serious health threat is present because of the location of the swarm, such as in a highly traveled public area, should you need to do anything with a cluster. They will eventually leave! Honey bees live in sheltered, darkened enclosures, so they will eventually set up home in old tree trunks, household cavity walls, chimneys, rabbit hutches, gas meter boxes, and of course, bee hives. Most of the time you will never see them again. An experienced beekeeper may be willing to gather the swarm and relocate it for you. 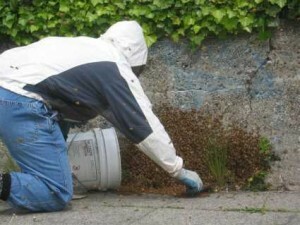 Beekeepers that are willing to relocate swarms may rightfully charge a fee since it is their time, effort and safety. When in doubt, ask. We take them to a safe place. We transfer them to a proper beehive. We observe them to see if they stay or if they try to fly off. We encourage them to stay by providing food (honey) and a warm, dry, safe space (the hive) to live. We check for parasites and diseases. If they have any we attempt to treat them. 1. They left before we got there. Usually a swarm will move from the original location within 24 to 48 hours, therefore, if a beekeeper is not available to collect the bees from a homeowner’s property, the bees will normally leave without causing a problem. 2. We could not access them. 3. We do not have permission to retrieve them. This may happen when the bees are on public property or the property owner does not want us to snip a branch to get them, etc. 4. No one happened to be available to help. In that case we always try to pass the opportunity on to our sister associations ASAP in case someone else could help. I Have A Nest, Not A Swarm. Help? 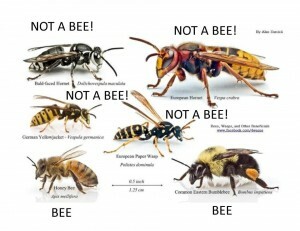 Established nests are trickier to deal with as a hobby beekeeper. 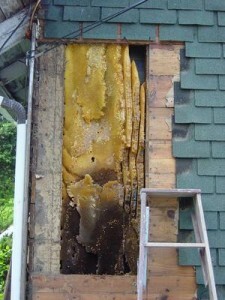 Honeybees prefer nesting in hollow spaces like trees or sometimes concrete telephone poles, but occasionally a chimney or entrance to your house walls proves ideal. 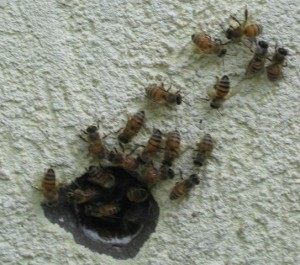 Consider this a warning: if the entrance hole is plugged, the bees will look for another exit. They may find another crack or opening or they could follow light and enter your living quarters instead through gaps in baseboard, electrical outlets or vents. That’s a recipe for trouble. 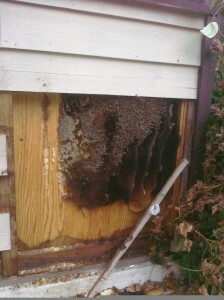 If you have honey bees in the structure of your property the BBA will not come collect them, as we are not rated for demolition work, etc and do not carry that type of liability insurance. There are other beekeepers who are willing to come help, however, and they can be contacted here if you are near the GTA. Those who do often charge a fee, just like a construction company, and may still leave the responsibility of any repairs up to the homeowner. Be sure that you agree first about price and what is expected in this service.